Carnival parade in Ste Anne Guadeloupe, January 14th, parades take place each weekend in a different region over the season. Frank London and the Klezmatics in concert at Town Hall, Manhattan, January 20th. Tal National perfoming at Littlefield in Brooklyn, February 23rd. The Nigerien rock group played a handful of US dates celebrating their latest album “Tantabara “. JouvayFest sharing the joy of carnival with school kids in Abidjan. Cote d’Ivoire. 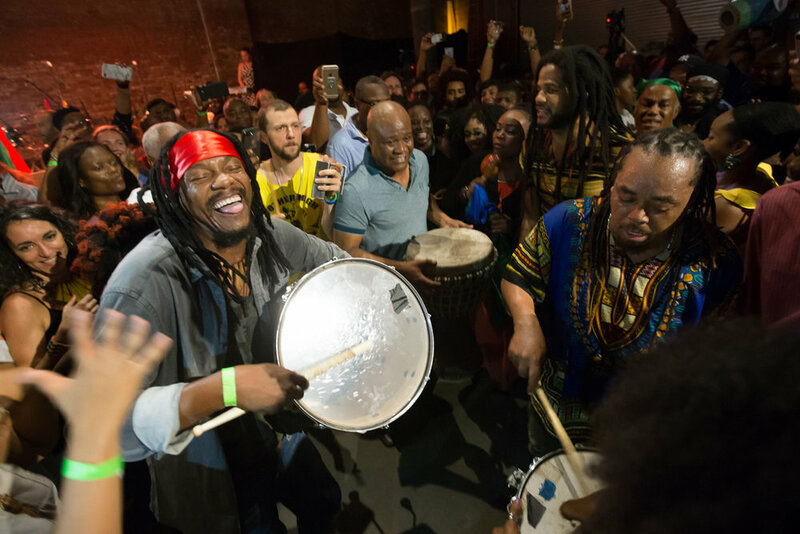 JouveyFest is a Brooklyn based Trinidadian carnival collaboration of musicians, Something Positive Dance company and Pagwah Mas jouvert band. Cameroonian vocalist Lornoar performing at the MASA festival in Abidjan, March 12th. Lornoar continued from here to tour Asia and Eurpoe before returning to Cameroon to end of the year. 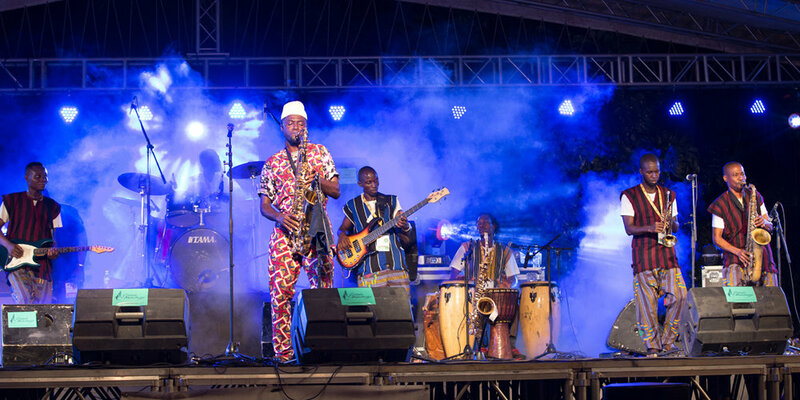 Seun Olota Nigerian saxophonist and bandleader performing at MASA March 12th, as a musician Olota identifies his music with the historical context of afrobeat rather than the afrobeat pop movement. Sidi Toure and band at the World Music Festival Mali Festival at Brooklyn Bowl April 14th. The esteemed Songhai musician supported the release of “Toubalbero” adding a new dimension to the sound by turning to electrified instruments. 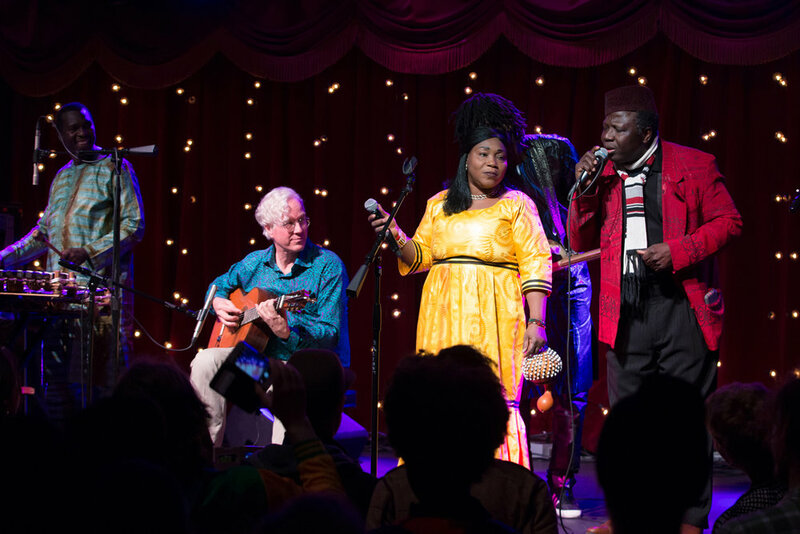 Malian supergroup Trio da Kali, Hawa Kasse Mady, vocals; Mamadou Kouyaté, bass ngoni; Fodé Lassana Diabaté, balafon with guests Banning Eyre on guitar and griot Kassé Mady Diabate, right, vocals; perfoming at Brooklyn Bowl. Fatoumata Diawara perfoming at the Brooklyn Bowl April 16th closing the Mali Festival weekend. Noura Mint Semali of Mauritania at the Lincoln Center Atrium June 7th, she and her band Jeiche Ould Chighaly on guitar, Ousmane Touré on bass, Matthew Tinari on drums fit in the NY appearance before heading to Bonnaroo and a European summer tour. Elida Almeida at the Lincoln Center Atrium June 21st, in her first New York appearance since 2015, perfrmed music from her recently released album “Kebrada”. Los Gaiteros de San Jacinto at Terraza 7, there is no better place to see Colombian music in New York City than this Elmhurst, Queens spot and these keepers of folkloric traditions have inspired generations of Colombian musicians. The Soukous All Stars at the Lincoln Center Atrium, August 23rd brought togetherElie Kihonia, Nyboma Mwan'dido, Ngouma Lokito, and Yohni Sungu in a show that rekindled the magic of 80’s Congolese sound . Boukman Eksperyans ending their perfomance with a rara procession through the audience at Pioneer Works in Brooklyn , September 15th. Voyagers, Edith Lettner sax, Yacouba Sissoko, kora and Banning Eyre, guitar at Barbes, September 20th. Michot’s Melody Makers , featuring Louis Michot of the Lost Bayou Ramblers, September 29th, at Sunnydale in Brooklyn. Kurdish vocalist and composer Aynur performing September 30th at the New School in New ork. Jupiter and Okwess at Littlefield , October 3rd. 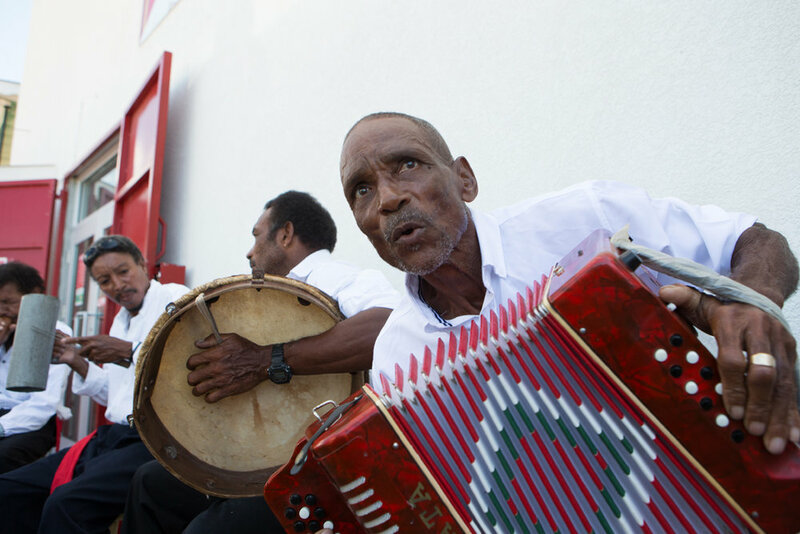 Isma Alie, a beloved jing ping artist on Creole Day in Dominica celebrated by street performances and traditional Creole attire in Roseau Dominica, October 26th. Dominica’s Triple Kay International on stage at the World Creole Music Festival, Roseau, October 27th. Their take on bouyon music a blend of various regional influences is honed in a razor sharp delivery fronted by three rotating vocalists and choreographed dancers. Cadence legend Poppa Chubby and the Midnight Groovers, from Grand Bay Dominica, performing at the World Creole Music Festival, October 28th. The group will be rerecording rare music originally done at DEBS in Guadeloupe in Paris in 2019. Mamadou Diabate at Littlefield November 4th. Diabate and his band Percussion Mania presented by the Worlkd Music Institute, an exclusive NY appearance before leaving the US following his Dartmouth College residency. Paul Beaubrun at Pioneer Works in Brookln November 11th. The show by the young haitian American star closed the PÒTOPRENS: The Urban Artists of Port-au-Prince exhibit. Cheickne Bengue Sissoko and Yah Kouyate from Mali in their first US performance at Silvana with Dembaya, November 23rd. Sekouba Belomba a locally based African Reggae artist from Abidjan, perfoming at Le Poisson Rouge, November 27th. Legendary Congolese vocal group Zaiko Langa Langa at Le Poisson Rouge November 27th. Darlina Saenz a Colombian bullarengue artist at the Jalopy Theater in Brooklyn, December 2nd. She performed with lov=cally based artists Bulla en el Bario musicians and dancers. The Bil Afrah Project at Elebash Hall, December 7th. Presented by Livesounds the Bil Afrah Project recreating the complete Ziad Rahbani album, a historic gathering of musicians in response Lebanon's civil war crisis with NY's finest artists with maestro Michel Merhej on percussion, Brian Prunka, oud; Bridget Robbins, nay; Marandi Hostetter, violin; Insia Malik, violin; Josh Farrar, buzuq/guitar; Zafer Tawil, qanun; Sprocket Royer, bass; Simon Moushabek, accordion; Gilbert Mansour, percussion at Elebash Hall in Manhattan.